There’s no doubt that as Christmas approaches, beers and ciders are some of our more pleasurable lighter tipples… One thing we don’t enjoy though, is in our rush to replenish our fridge, is only having a limited choice from supermarket. Supermarket buyers please take note: There are some fantastic indie brands there! With a little research we’ve found some new and interesting options, from fruity ciders to chocolately beers. Keep reading as we at The Amazing Blog introduce you to some of our new festive favourites! Let's start with something fresh. Sassy's Cider, created in Normandy, is made of 100% pure juice, is 100% natural, low in calories and no added sugars. We started with the L’inimitable, a bright and golden balance between a traditional-dry cider brut taste, and the fruitiness of a semi-dry cider. It works well as an aperitif, but is also delicious alongside any meat or cheese. The full bodied aroma reveals apple and leather, creating a subtle balance between acidity, bitterness and roundness. Our next treat was Le Vertueux. Clear and pure, this can be perfectly combined with fish or light chocolate desserts as it gives you a sharp and slightly tannic mouth feel at first, finishing off the soft and subtle flavour of pear. This taste is something we certainly hadn’t come across before and it’s delicious! Our favourite however, is La Sulfureuse, a cider blended with apple spices, creating a soft and semi-dry cider. Ideal with desserts like sorbet or pastry. lt is lower in alcohol than other ciders and has an intense pink colour, as well as a delectable smell of apples and red fruits. If you want to try Sassy’s ciders for yourself, then you can purchase 12 mini bottles (330ml each) for €44 or 6 bottles of 750ml each for €43 here. Alternatively, you can purchase a set of three for £24 on the John Lewis website here. Delivering to businesses all across the UK, you can purchase the 6 bottles (500ml each) for £15.18 here. Alternatively, you can mix and match this cider with other great options, buying a selection of 6 flavours, including Mango or Apple & Blackberry. Click here to personalise your own crate. Moving away from cider, and onto beer, we came across Lowlander. There is no doubt that Lowlander’s Beer shines amongst the competition, with a range of awards for their botanically brewed beers. With its snappy branding inspired by travel to far-away lands, and discovery of exotic herbs and spices, Lowlander beers are packed full of flavour and character. A whole new dimension of flavours is added thanks to the botanicals used, and their website provides advice on how to combine your favourite beer with either food or other alcoholic beverages. We tested Lowlander’s Yuzu & Pink Grapefruit beer, and were surprised by the lightness and freshness of this beer, revealing a bright citrus flavour characteristic of having being brewed with earl grey tea and gose beer. We also tried their Ginger & Kaffir Lime beer, which is, in contrast, rather spicy and aromatic, delivering hints of zesty citrus. This beer is brewed with Darjeeling tea and wheat beer, and both beers are presented in colourful and flowery bottles, sure to brighten up any day. With this innovative combination of botanicals, tea and beer, Lowlander wanted to provide innovative lower alcohol options (2.5% vol.). Their beers are subsequently lower in alcohol content than other competitors, but we certainly don’t think this has dampened their flavour! Launched at the Speciality & Fine Food fair in London, these beers can now be purchased from €15 for 6 bottles (330ml each) on their web shop and you’ll find them stocked in many good bars and shops. Another innovative brand we came across is Pillars, founded by four guys who have created their own Lager Revolution in London. Finding its roots in a garden shed, the aim of the brand was to prove that a craft lager can be just as tasty as its ale counterparts. This is something that we think has turned out to be a great success. With a lot of creativity and quality, the tasteless reputation of Lager has been smashed! 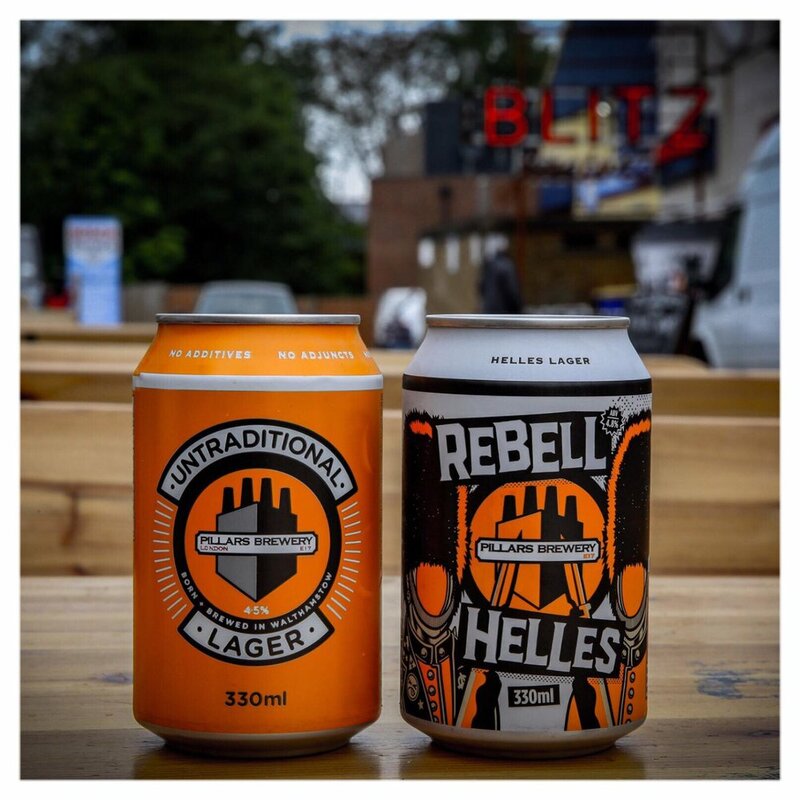 Their first creation was the Untraditional Lager, which has since become the all-time favourite (and our favourite as well). This 4.5% Session IPL combines ingredients from all over the world, producing a never before seen combination of a pilsner and hoppy IPA. This creates the delicious flavour of local British malts, with softness and fruitiness which has a slightly citrusy, but definitely crisp, finish. We also tried their Rebell Helles (4.8% vol.) lager, which combines traditional Helles Lager with new world hops. It is most definitely waves two fingers to boring beers! It is a malty maverick, revealing a full bodied taste, yet is easy to drink. Based in Walthamstow, East London, the brewery pays homage to a brand that wants to change perceptions of lagers. The packaging is metallic orange, and black and white in design, offering a graphic look that looks great on any shelf. With a reasonable price of £2.65 for 330ml, this fresh taste is definitely worth a try. Visit their website here to see for yourself. Our last stop of this revealing beer and cider discovery tour is Big Cat Stout from Stroud Brewery, a British Craft Brewery founded in 2006. They create premium organic beers, offering a wide range of beers in cask, cake bottles and cans. Starting out as their pet project, this dark stout is organic, and vegan and delivers a silky complexity of dark roast malts. We decided to give this 4.5%, easy drinking conditioned stout, a try. We were certainly more than satisfied. Encased in a stylish and simple bottle with a graphic red logo, we were impressed to find that this stout is organically brewed, without any artificial preservatives, flavourings or colourings. The taste is not highly bitter, and we think is best combined with rich spicy foods, mature cheddar, chocolate or coffee based pudding. The silky smooth texture is full bodied, delivering a fruity dark chocolate aroma, with a hint of liquorice. Winner of a 2 star Great Taste Award (2017), this beer is definitely not what you find in an everyday pub! Purchase 12 bottles of 500ml each for £33 here. As Christmas draws nearer, we hope to have opened your eyes to a few new festive tipples, we think in particular that these are great for those who normally steer clear of beers, ciders and stouts. So go on, give it a go, why not try something new?